O.T.O. Frater Superior Hymenaeus Beta has done a tremendous favor to the biblically-unschooled by calling out Crowley's ubiquitous biblical quotes and paraphrases in the recent editions of Magick. A quick glance at the “Authors and Works Cited” index in Magick shows well over seventy biblical citations or references in the text of Book Four. But it is not only through Crowley's personal intellect and experience that the Bible has had a critical influence on the character of Thelema. 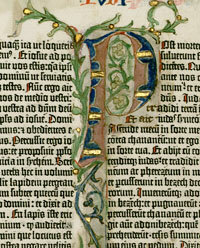 Consider that as a revealed scripture, Liber AL is written (principally) in English. Like the Arabic of the Koran, the English of The Book of the Law adheres very scrupulously to the oracular literary form, and thus the original language is of paramount concern. Consider Liber AL II:55 and III:47, where the “English alphabet” is remarked as an important feature, and there is a mandate always to include the original English manuscript in all editions of the book. In fact, the word Θελημα occurs in one of the best-known gospel passages, the only actual invocation prescribed by Jesus, the “Lord's Prayer,” as it appears in Matthew 6:10, “Thy kingdom come. Thy will (Θελημα) be done in earth, as it is in heaven.” Crowley wrote two updated versions of that prayer, in The Book of Lies chapters 2 and 44. In each case, “Thy will is done” is included to indicate transcendence of the earlier formula. As regards the saints of the Gnostic Catholic Church in the canon of Liber XV, the Bible is the chief reference for the exploits of Mosheh (Moses) and Melchizedek. And it also serves as a text historicizing Simon Magus, after its fashion. Crowley selected Grady McMurtry's magical name Hymenaeus Alpha. While the name doubtless includes an allusion to the Roman god of wedlock, so happily hymned by the Gnostic Catholic saint in Catullus LXI, a more crucial reference is I Timothy 1:19-20. The Bible passage upbraids “Hymenaeus and Alexander; whom I have delivered unto Satan, that they may learn not to blaspheme.” Besides the blasphemy (see Revelation 13:1) and Satanic instruction, this text pairs Hymenaeus with Alexander, i.e. Edward Alexander “Aleister” Crowley.